Summer is upon us, along with a heat wave that is knocking down much of the Northern Hemisphere, from Miami to Matanzas to Madrid to Münich. Cuba Counterpoins is barely one-and-a-half months-old and many of us are about to hit the beach or, alternatively, the air-conditioned couch for a well-deserved rest. 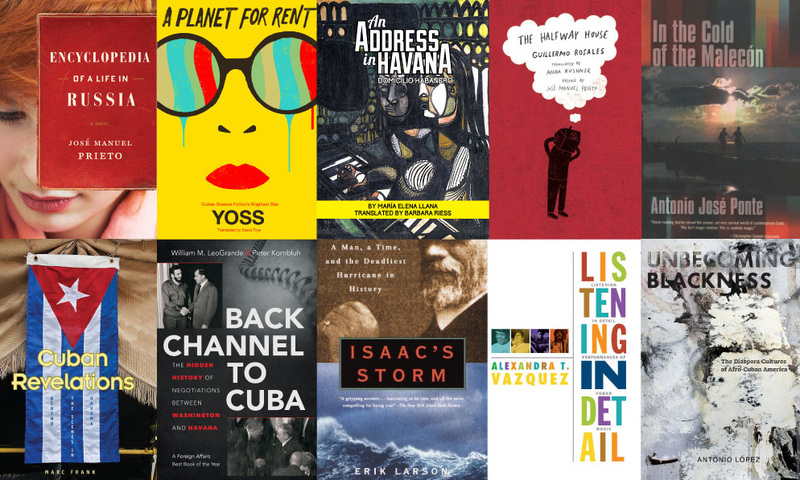 In case you are too, or at least you have some down time, we -the Cuban Counterpoints community- have a few good reads in mind for you: ten, to be exact. They are here divided into Fiction and non-Fiction. Our first recommendation is Encyclopedia of a Life in Russia (Grove Press, 2013, trans. Esther Allen), the first of Cuban writer José Manuel Prieto’s Russian trilogy, originally published in Spanish in 1997. Jacqueline Loss finds it a fascinating book for us to visit in this post-D-17 time, as it tries to explain, in a rather ironic encyclopedic form, Russian life at the time of its transition to capitalism. Prieto, a Cuban student in the former USSR at the time, is the inconspicuous observer; a knowledgeable outsider whose origins are hardly stressed. 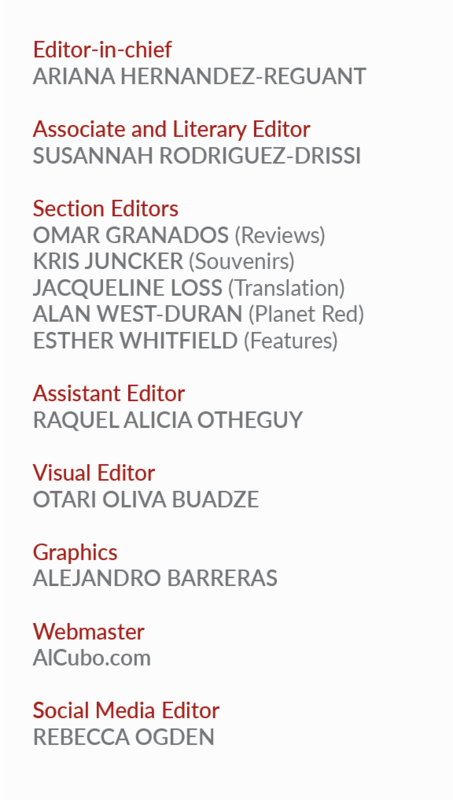 The translator deserves special mention because finding an equivalent for the Spanish and Russian alphabetical order of the entries, in English!, is nothing short of genius. While we should not read Encylopedia as an allegory for current Cuban times, there are certainly many curious reflections about post-Socialist life and the act of watching it unfold. The parallels are up to you, and because of that, it makes for a great read. In a Cuba where tourism looms as large as a flying saucer over the economic and cultural future of the island, Cuban SciFi writer José Miguel Sánchez Gómez’s [Yoss’s] A Planet For Rent (Trans. David Frye, Restless Books, 2015), has just been published and it is a must-read-now sort of novel. An allegory of the Post-soviet 1990s on the island, this book spins a mean Near Future tale where Aliens transmogrify the planet into a tourist destination. Needless to say–and as the novel may ultimately suggest–we are all Cubans. Full review is forthcoming this summer from Off the Press. An Address in Havana/Domicilio Habanero (Trans. Barbara Riess, Cubanabooks, 2014) gathers together some of the most fascinating short stories by journalist and writer María Elena Llana. Written over several decades, these portraits of female characters navigate changing worlds, told in a mocking spirit that frequently gestures toward the supernatural. Like all of the publications of Cubanabooks, a small, independent publisher focusing on writing by Cuban women, Llana’s is published in an attractive bilingual edition. For me, it is Guillermo Rosales’ The Half-Way House (Trans. Anna Kushner, Intr. José Manuel Prieto, New Directions Paperbacks. 2009) –barely a hundred pages long and a page-turner. Twenty-five years after the Mariel boatlift that brought both the late Rosales and his alter ego, William Figueras, to Miami, the autobiographical story still sends chills down my spine every time I walk or drive around Little Havana and see its dilapidated buildings, scruffy streets, and, well, half-way house tenants. Magnificently translated in all its sordidness -the sordidness of a Cuban immigration that remains invisible behind the exile success story- I would say The Half-way House is the best novel ever written in and about Miami by a Cuban exile. We really wished we were In the Cold of the Malecón (by Antonio José Ponte, trans. Cola Franzen, City Lights Books, 2001) right now, but this is not why we are listing this book now. It is a slim collection of short stories that, for Esther Whitfield, is as luminous a read now as it was when it was first published, in Cola Franzen’s beautiful English translation. Ponte traces situations and characters with a singular sensitivity, reflecting as much on love, loss and isolation as on a Cuba both familiar and strange. Marc Frank’s Cuban Revelations, Behind the Scenes In Havana (University Press of Florida, 2015) is our top non-fiction pick. Cuban Revelations is a well-documented and insightful view of the last twenty-years in Cuban history, written by a veteran British reporter who lived through them. Our Alan West-Durán has found the book very engaging, noting the author’s sensitivity and humor, as well as his insider access to all levels of Cuban society. The book is divided into four parts, “The Revolution on the Ropes” (1994-2008) that covers the Special Period; followed by “Raúl Castro in Power” (2008-2009), on the transition with the rumors about Fidel’s health looming in the background; and “The Road to Reform (2009-2010) and “Brave New World” (2010-2013), on the ins and outs of the new economic policies. Although a few elements of Raul Castro’s changes are treated somewhat uncritically, Frank’s introduction has an excellent explanation as to why when the Middle East was going through its Democracy Spring, Cuba did not follow suit. William M. LeoGrande and Peter Kornbluh’s Back Channel to Cuba. The Hidden History of Negotiations between Washington and Havana (University of North Carolina Press, 2014) offers a historical perspective to this past December accords between Barack Obama and Raúl Castro. The authors thoroughly scrutinize all diplomatic documentation concerning the communications and exchanges between Cuba and the United States, painstakingly “unearthing classified information” as they put it (or recently declassified), to then organize the never boring account chronologically by U.S. president, from Eisenhower to Obama. The title has been wholeheartedly recommended by all major periodicals and news outlets in the United States, including The New York Review of Books (by Enrique Krauze), Foreign Affairs (by Richard Feinberg), and NPR, and in case you did not hear it from them, we are joining in the choir. One of the main thorns in U.S. Cuban relations throughout the 20th century has been Guantánamo Base, which the U.S. leases from Cuba in perpetuity. Our colleague Kris Juncker was persuaded that the U.S. will never give it back after reading Erik Larson’s Isaac’s Storm (Oyster Books 1999). There, the best-selling author and journalist offers a gripping account of Hurricane Isaac, which decimated Galveston, Texas, on September 8, 1900. By way of a subplot, the book offers the most convincing explanation about why Guantánamo Base will continue under American control. A mere dot on the map, this geographical location is more than just a U.S. military installation. It is a weather station, and as such, the crux of meteorological happenings headed for North America. Although the book was published a bit too long ago for our taste, Kris insists it deserves the limelight just the same. Issac’s Storm, she assures us, is creative non-fiction at its best. To end, Antonio López’s Unbecoming Blackness. The Diaspora Cultures of Afro-Cuban America (New York University Press 2012) recreates several moments in the history of Cuban immigration to the United States. It takes us from New York City in the 1920s and 30s, where Cuban immigrants donned blackface in Spanish-language minstrels, to the Mariel era in Miami, which served as a landscape for the author’s father’s violent demise, to Cuban Americans’ nostalgic return to Cuba in the 1990s to find an Afro-Cuban occupied house. The language is beautiful, the writing is riveting, and I can honestly say that this is the Cuba and/or Cuban diaspora-themed book I have most enjoyed reading in years. We hope you enjoy our recommendations. We wish you a happy summer and hope you will stay with us into the future!